If your family has ever stopped by a Build-a-Bear workshop in most major malls, then you'll know how imaginations come to life as children stuff and then groom their new favorite stuffed toys - right before they dress them. 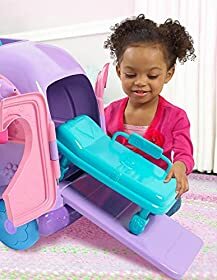 This year, the Doc McStuffins Get Better Talking Mobile Clinic is bringing that type of environment right into your home! 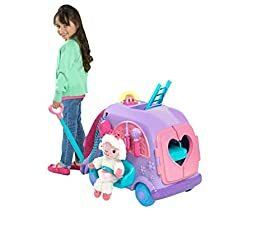 Only instead of stuffing and grooming, your son or daughter will be playing a veterinarian role and caring for their favorite stuffed animals with these Toys. The mobile clinic is a pull-along toy that is similar to an ambulance and clinic all rolled into one. It comes with motion-activated sounds and to accompany those sirens are lights that let everyone know an emergency is underway! 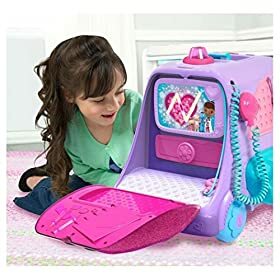 When your child plays with the Doc McStuffinds Get better Talking Mobile Clinic, they'll get to play with the doctor instruments that come with it. 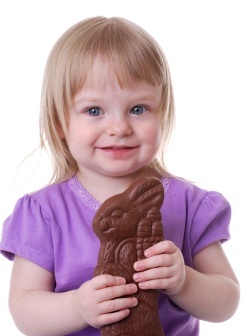 It's pictured with a little lamb stuffed animal, but that's not included. You can either show your child how they can use it with their existing stuffed animals, or buy a brand new one and put it under the Christmas tree with the Get Better Mobile Clinic! If the clinic is picking up a stuffed animal that's stranded - like a cat stuck in a tree - then there's a convenient ladder that helps rescuers get it down from its dangerous perch. The clinic is so realistic, with a heart monitor, thermometer and otoscope to make sure the little critters are in perfect ear health. It even comes with fake bandages they can use to help heal minor wounds. Just like emergency workers in ambulances, your child can use the CB radio to call ahead to the hospital and let them know what to prepare for, in case it's a big deal. Before the stuffed animal arrives, your child will put the stuffed animal on a stretcher and secure them so they can be rushed into surgery! 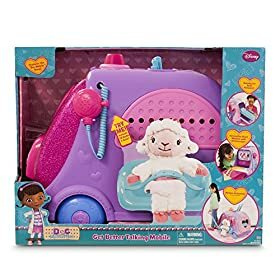 If you want to, you can buy the stuffed animals that Dottie McStuffins works with on a regular basis - Stuffy, Hallie, Lambie and Chilly. It comes with the two double A batteries that it needs, but you'll need to buy more in the future whenever these batteries run out of power. Might as well get rechargeable ones. 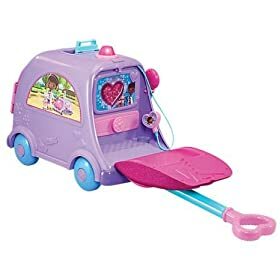 Kids will love this toy and it's perfect for both boys and girls! 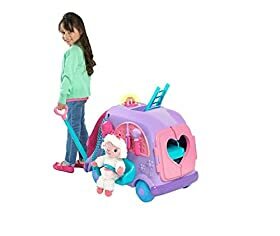 Junior Doc McStuffins Get Better Talking Mobile Clinic Cart Toy NEW! If you are pressed for time and just do not know what to buy, you can trust the Top 10 Toy List to provide suggestions that make for a no-miss toy purchase this holiday season.